Today we have all assembled here. And this is the last day of this Hans Jayanti program which is in honor of my father who was my Guru, and who founded Divine Light Mission. In his honor, on this occasion of his birthday, we celebrate this program. 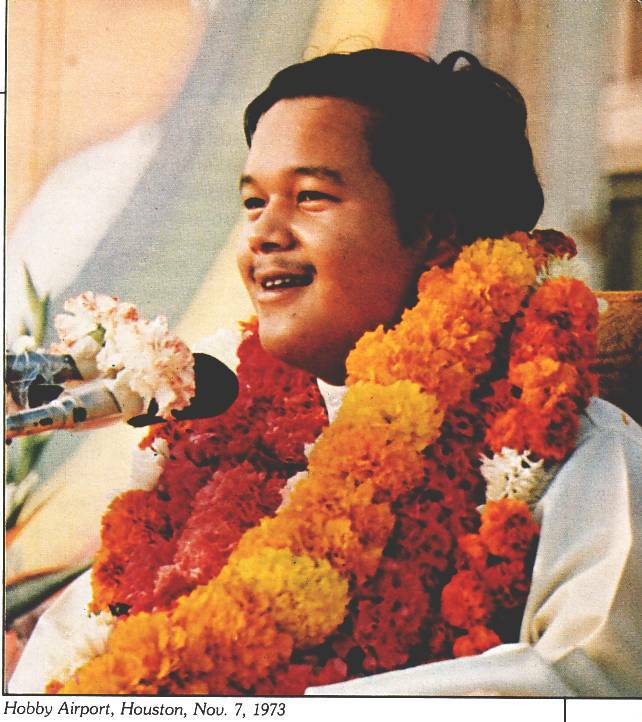 And all the devotees from all over the world assemble at one point to honor him, to realize, to respect, and to understand that beautiful perfection that has been revealed to them within inside of them. Now today will be our 'goodbye day' because people who have come from different, different corners of the world are going to go back. And I'm also going back. And after that, we'll probably meet again at a bigger festival than this. The thing is that this life is a big car, it's a huge car -- and inside this car there is a big, big engine. And in the engine there is a carburetor. And the carburetor runs from a line, it's called a fuel line, which supplies fuel to the carburetor. In some cars, before the fuel line hits the carburetor itself, there is a thing called a filter. And what this filter does is, if there is any dirt in that fuel, it will filter it right out, so that fuel going into that carburetor is pure. It won't cause any disturbance in running the car and operating the car. In this life, within our brains, within our minds, there is this little line running. And we need a filter to filter that line out. And this filter is called Knowledge. Because we are not being filtered, probably. There are so many dirty particles coming in the fuel line -- of our imagination, of our thinking, of our desires. Then eventually, when they go inside the carburetor and go inside the engine, they destroy the whole engine. It's just like fueling the whole engine. And then the car doesn't run properly. And you think: "What's going on? Why is the car not running properly?" And ladies and gentlemen, we are big cars. And to our brain, to our thinking, to our imagination, to what we have understood of this life today, runs a little line of love, of that Vibration, of that Perfection. But, in that line, when there is no filter in that whole system, when we are not properly understanding it, when that Perfection is just not coming to us perfectly, but it's coming to us with all these other crazy things, we do not run properly. And this is causing the energy crisis, or any kind of crisis, in this world. And that is why there are so many people, so many, so many people unsatisfied. There is a saying that a rich man thinks that a poor man is satisfied and a poor man thinks a rich man is satisfied. The rich man thinks maybe a king is satisfied, and a king thinks gods are satisfied. And gods think God is satisfied. But who does God say is really satisfied? He refers to those people who have understood Knowledge, who have understood this Perfection. They are the ones who are really satisfied. Because satisfaction is like the goal of our life to which we proceed at every second. Because there are so many desires and just to get rid of those desires itself is called satisfaction. If I want a camera, I have a desire for a camera -- until and unless I get the camera I will not be satisfied. I will do something or the other to get that camera. And only when the camera is with me will I be satisfied. the problem is that we are not satisfied in this world. Now if we eliminate, if we get rid of that little part within inside of us that is making us unsatisfied, then naturally what will be left? If from ten you take out the zero, what's left? And that is the exact same thing: there is the little zero which has separated us into ten parts, and we have to go to all these ten parts of our life that we have scattered, at one time. But if we take that zero away -- zero means nothing, nothing at all. A dead man doesn't have any desires. But, if you take out that zero, then one will be left -- only that one that we want to be one with. Only then: there won't be two things. There'll be only one thing left. And we will be completely merged. Because there will be nothing else to merge with. We and our Father will be one. And this is the way to do it. I have done it. This Knowledge was revealed to me. I have done it. And so you can also do it. Because see, there was one point also in my life when I had not understood Knowledge. I was just a little kid going to school, studying. But because I had so many occasions to go with my father when he used to give spiritual discourses, something completely shattered an idea right into me that there must be something superior, there must be something more beautiful, than what I think there is. Because so-called happy people, who claim that they are happy -- well, I didn't claim I was sad at that time, either. I thought that I was very very happy -- until there was a point when somebody told me that there is a greater happiness than what you are thinking about. And I really wanted to get to that happiness. Because it is man's own nature to reach for the highest, to always reach for the highest. Well, it's a little different here, because sometimes man is facing towards the lowest, thinking it is the highest, and he aims to it, he dives in it, because he thinks that's the highest point in his life, and he tried to dive to it. But it's actually a lower point. And that's the time when man gets into problems -- otherwise, really I don't think anything is a problem in this world. I don't think so. Because the way this whole creation has been made is perfect to tip and toe. It's just perfect. It's just beautiful. Means, you have been to different places, and you have seen beauty of nature. It's completely gorgeous. It's completely beautiful. Sun comes up, it just comes out, and it's like, when it comes out, everything just comes completely alive. And on a full moon, well, many people might be scared of werewolves. But just guess there is no werewolf. Really, what werewolf is is our mind. It comes on a full moon, which is like a sun for him. But actually it's a moon. And he gets illuminated by it. He gets affected by it. And he turns into a werewolf and starts eating you up -- that's our mind. So just imagine the ocean and it's just beautiful. Mountains. And this full moon just shining right on top of the ocean. And whole ocean is just being completely filled by all these rays of moon just coming right on the waves and shining -- it's beautiful! Well then there is a beauty from which that beauty that we see came out from. Now that is that real beauty that we all have to get to, that we all have to aim for. Ladies and gentlemen, until and unless we know the proper aim of our life -- I will tell you something -- it's very hard to proceed towards our main goal, towards our main destination that we want to make it to. First we have to understand what it is. First you have to recognize, first we have to feel, and understand, that this is our destination. How? Some people can tell us about it. People who have known, people who have recognized that and taken it as their destination, and reached there and seen that, yes, everything is A-okay. Those are the people you go to. And such people are called Perfect Masters. They tell you about that Perfectness that they have experienced, that they are one with, and then you understand more and more of it. And this is the point: we have to understand that perfect, perfect beauty that is creating this whole world at every moment. It's making it so beautiful. Imagine how beautiful would that God be who created all this beauty. When we say "wow" for this beauty, what are we going to say for Him when we see Him? We can't say the same word, "wow," because that's what we say to this beauty. But what will we say to Him? Well, you don't have to bother about it. Because when you see Him, you won't have to speak. Because at that point, it's no speaking. It's just no speaking. Because everything is just completely into flow, and it's just Perfect, that's all. There is nothing more. There is just nothing more to it. Because there is one point. You drive. You take a car from your home, till you come to the house. But when you come to the house, you leave that car and just walk right in. And then there is no more driving. We just go right into the house. And that's the exact situation here. We can use all our imaginations, our minds, our books, our scriptures, our talks, or spiritual discourses, to make you understand that there is something like that and you must get it. You must get it. You must get it. But finally, when you realize, all of these stop. Because they just go to one point. It's like, when you are driving on highway, the signs say: los Angeles,' 'Los Angeles,' 'Los Angeles,' 'Los Angeles.' They say from one point to other point: 'Los Angeles,' 'Los Angeles,' 'Los Angeles.' But when you are there, what is the counting? You start from maybe ten miles away, you go '10, 9, 8, 7, 6, 5, 4, 3, 2, 1, 0,' and once you are into it, there is no more counting required. Because you are right there. How can you even count it? So like all these steps that we are taking to realize God are these different, different, different miles we are trying to approach to, and trying to understand. But when we reach to that point, when we hit that point when God is with us and when we are one with God, there is no more. And it's just completely Perfect and just completely beautiful. See? So that is why we have to understand people are becoming too attached to this materialistic world. But how we have to be in this materialistic world is like a lotus flower, which is born in the dirty water, it's sustained by dirty water, but still it does not touch the dirty water. It's beautiful. It's far above that dirty water you think about. And this is how we have got to be to live in this world, to be sustained by this world. You still have food and everything, but still be like a lotus flower, still be away from it, far, far away from it. Because you can be. You can be like a lotus flower. And isn't a lotus flower beautiful? I think it is. I think it's very beautiful. And this is what we have to be. And now, it's like different, different ways of explaining that one Perfection that all these scriptures have described. Because it has been said in different words by different saints. They say the exact same thing of this realization, of this Perfectness. Because it is within inside of us all. But it's only that we have to realize it. We only have to see within inside of us. And then once we see it -- I just told you, there is no question about it. Then you are with Him. That's within inside of you. It's like, you have a black mark, a black spot, maybe it's just because of oil or something. You don't notice it because you can't see it with just these eyes. So your friend tells you, "Listen, buddy, you got a spot up here." So you know there is something wrong. Or he is kidding. Two things. And then you go, "Okay, I am going to check it for myself." So you go before a mirror. You see it. Doesn't take you a split of a second, when you see it. That mark is there. Just wipe it off, it's gone, and that's it. And this Knowledge is that mirror. And Guru is your friend. Perfect Master is your friend. And he comes to you and just tells you, "Sir, you got a black spot." And you say, "Okay, I'll check it for myself." yourself. Then you just wipe it right off, and everything is okay. Everything is fine. And this is how it is. But there is one point about this Knowledge that we really have to understand. I can assure you of one thing: I can establish peace in this world. I can assure you of that. Because the Knowledge, the power of the Knowledge, is incredible. And when people understand it, when people realize it, that's it. That's it. That's it for them. And this is the way we can establish Peace on this earth, on this very planet, in this very century. We can do it. It's no problem. It's no big mess up. It's just the way how to go around doing it is the only thing. Otherwise, it's very possible. And that world of Peace, that kingdom of heaven on earth, is very possible. Because, as I was telling you the other day, God is not going to come with a purple screen and pull it up on the blue sky and say: "There is kingdom of heaven." What is He going to do? Because our imaginations have been just computered since we were born, as God being a man. So that's what we always think. "Oh, well God's going to come with just two legs and two hands, walking by on a road, shouting, 'Here I am with the kingdom of heaven, you ready for it?,' and all the people go, 'Yes sir, yessir, yessir.' And probably police come blowing their sirens off, saying, 'that's a madman, take him to the hospital.' " See? And this is just how it is: we have to realize God practically. Practically understand. And if we understand, then really this kingdom of heaven is right here. It is right here. It doesn't have to come from anywhere, it's just that we have to change. It's just that we have to realize if it's here or not. And feel it. And be one with it. And then we know it. And then, when we know it, it's with us and we are one with it. Because whatever Jesus taught to His disciples has not disappeared -- it's still there. Because at that time, if those people stayed alive, it was because of the same Knowledge. And if at this time people are going to stay alive, it's because of the same Knowledge. And you're alive, and it's because of that same Knowledge. But you have to understand it; you have to realize it. I am not claiming anything on top. See, I cannot promise you anything, except one thing -- I can't do promises to you saying, "I'll do this for you, and I'll do this for you, and I'll do this for you." I can promise you one thing: I can promise you World Peace. I can promise you Peace of mind. And these are the things I can promise you. Because I have them, and I very well know I have them. It's no objection about it; it's no problem about it. It's no doubt in my mind about it, that I have it, and I can establish it. And it's like, that big question is in you: "But how? How are you going to do it?" Well let me do it. And then I'll tell you how I'll do it. It's like, you come to me and I bring a dress to you, and I say, "I'll get you dressed up, then you will know how." But if you start struggling to not wear the dress, then that's going to be pretty hard for me. Then I'll have to tie you down and then put the dress on you, which is just not the gentleman's way of doing it. A gentleman walks in the shop, he gets something, and then he just stands and relaxes. Tailor comes, puts the suit on him, and that's it. He has the suit on, and tailor won his bet. And that's how it is. But you've got to cooperate with me. Many people in this world say many, many things about me. They don't understand. Because they are saying, "You are this, and you are that." And we are not even talking about it. We're talking about a third thing: the third thing that Knowledge is -- that thing that's within inside of us. We are talking about that. Nobody's talking about me, here. I'm not talking about myself. I'm talking about that Knowledge that has to be accomplished in this world, that Knowledge that has to be put into this world. Because that's the way to Peace. We all want Peace; we all are trying to work for Peace. All the different people are trying to come up with new ideas for Peace. You want Peace, give me a try. Let me have a try, and I'll establish Peace for you. It's a simple deal. It's like infinity to zero. I want nothing out of you, and I'll give you that infinite thing. I'll give you that infinite Perfection. Because you see, this is like a circular world and it's surrounded with something. And we are that circular thing, we are surrounded by something. But maybe we do not know until somebody really comes and tells us that we are surrounded with that circular beauty, with that beautiful, beautiful, beautiful thing we are all looking for. It's like, sometimes we do a mistake. The ring is on our hand and we are searching for it: Where is it? Where is it? Where is it? And then there is one point -- when you are tired, really tired, and you're sweating all over and you don't know what to do and you are angry, and you go like this -- and the ring scratches you. And you say, "Oh, look at that. What a fool I was. It was right on my finger. And I was looking for it everywhere." And this is what many people say when they receive Knowledge. Really, they do. Because that's exactly the way it is. They were searching and searching and searching and searching and searching and searching and searching and searching and searching. They got sweaty and tired and said, "I don't want it anymore, even if it comes running to me, and forget it!" And they are doing all this and suddenly it's like -- there's a better story I can tell you. There's a better example which I have given many times. And I'm going to give it again. Maybe many people haven't heard it. There is this man who comes into Houston. And he's looking for a Superman comic. And he goes searching right around Houston. He searches the Astrodome and he searches all stationery and bookstores and every place. He can't get a Superman comic. So he goes to every house and, just every place possible in Houston, searching for a Superman comic. Even in the mail boxes. And everybody says, "We don't have it." And he's tired and it's humid in Houston, and he's sweating all over and it's really miserable for him. He just goes and sits under a tree and he says, "Oh no, I don't believe it. What were they talking about, all these Superman things. I can't find it. I can't get hold of it." And then he is sitting with his eyes closed and suddenly a little guy, four years old, five years old, comes up to him with something under his shirt and he shakes him up and says, " 'scuse me." And you go like that: "What's up! What do you want?!" Because you are frustrated you know, you are not in a cool way. "What do you want, get out of here! I don't want you. Don't disturb me. Let me have some peace of mind! I am sitting here relaxing!" And then he says, "Oh I am sorry but I thought you wanted a Superman comic." And he says, "What do you mean?! I wanted it. I was looking for it all over the place. I couldn't get it!" He says, "Oh no? I can give it to you." It's like he is a really cool boy. He is just smiling. He's cool and you're all screwed up and just ready to burst open, and you just don't like that cool boy at all, because he is too cool for you -- just too cool. And I'm not blaming you for that, because it's just a point of frustration you are on. You just don't like cool guys around you, you want them hot. So that they can really boost up that thing inside of you. And then he opens the first button of his shirt and you look, "Hey man, I don't believe you, what's going on?" And then he takes out the Superman comic and he gives it to you and your mouth is open just like that. And if you don't just believe it, it's there now! And one moment ago it wasn't there. And the next thing you know it's in your hands. You didn't even have to do anything about it. The boy just came up to you and gave it to you. And for five minutes, maybe, you will be a bit flipped out, because you won't understand what's going on. This Peace you were thinking about, searching for, is right in front of you, it's right there. There's no question about it. And after that, everything is just beautiful and everything is just cool. And then, the only thing you want to do is just to take that boy and start hugging him, because what he did for you was just so beautiful. Because you were looking for it. And that's the exact thing, with all respect to you. I was just acting for you, you know, all that. Maybe you won't do it like that. Maybe you are also cool. But it's like, still there is a little bit of frustration. And this is what happens with people. I have dealt with millions and millions and millions and millions of people. Really I have. I've even gone to people's houses and talked to them about this Peace. You know what they say? "Come on, will you please leave me alone? No, don't talk about that thing, that thing doesn't even exist. I know it." And they are so sure about it, because they searched and they couldn't find it. So they know it. It's like you are looking for this person all over the house and suddenly he pops out of the room and you say, "Hey, where have you been? I was looking for you all over the place." And then he just gives a big smile and says, "If you were looking for me all over the place, why didn't you look here? That's where I was." And you say you were looking all over the place for him but you really weren't. You searched three rooms and you thought that's all over the place, can't find him. And he was probably in the fourth room, and there he pops out and you say, "Hey, where have you been? I've been looking for you all over the place." And he said, "Why didn't you look in the fourth room? That's where I was." And that's the exact condition. We're looking for God all over the place and suddenly we have a little feeling of Him. Suddenly we feel Him and say, "Hey, where have You been? I was looking for You all over this place." And God says, "Why didn't you look inside of your heart? That's where I was." You haven't, you shouldn't, go anywhere. It's right there. There's just different ways of explaining one meaning that I want to relate to you. That Knowledge that we are all searching for, that Peace -- because we are searching for it, no matter if we don't call it Knowledge. Maybe we call it Peace. Maybe if we don't call it Peace, maybe we call it satisfaction of mind. Maybe we don't call it satisfaction of mind, we call it something else. Maybe we call it the dog with the little green thing in his feet. But it's something we are all looking for. Maybe we don't call it that, we call it two fingers straight up (victory sign). We call that 'peace.' But we are all looking for that one thing. Everybody is. No matter in which way they are looking for it. Maybe they are looking for it in money. Maybe they are looking for it in different things. Maybe they are just looking in materialism. They are just looking for it in something. But we are all looking for it, and we all want it. The day we approach the proper person -- the day, the moment, the second -- we approach to the right person, who can give it to us, then he gives it to us. And when he gives it to us, it's all there is to our lives. Because you see, there is a saying in Sanskrit: If you give pearls to birds, they won't eat them. If you give all these beautiful, beautiful sweets to donkey, he won't eat them. Now I think when that band was playing, and all that light was being just put on them, they looked pretty beautiful. But if there was a blind person sitting, for him, that doesn't mean anything, no matter how beautiful lights you put on them, just doesn't mean anything. And I think they also did a very good job playing all the instruments. But if there was a deaf person here, it didn't mean anything to him. It was all blank. So in the same way, it says, to a person who has blocked off himself, who has isolated himself from the search for Truth, who is mad if you try to talk about God in front of that man, it's going to do him no good. Because he has isolated himself. He has trapped himself. He has closed himself and now you are trying to just reach and it's like -- no matter what there is, if there is poison inside the bottle, you can lick as many times as you like off from the glass, it won't do anything to you. But as soon as you open the bottle and take it in, that's it. It's inside the bottle. But if we just keep on licking it from outside (if one drop hasn't dropped down on the outside) brother, you just can keep licking it. And there can be poison inside, that won't do you any harm. But as soon as you reach inside and it's on your tongue, you are flat on your back. And this is how it is. And this is how people understand. That no matter how much we look in this outside world, this outside world is just a reflection. It's just a reflection. Because it says that this creation is going on. There is a time when spring comes, and we think it's beautiful, green. And then there is one point when fall comes and everything is gone. All those beautiful trees are gone. They are just mud now. They are all just rotten leaves. You don't even want them. At one point, to just see them on the tree, you didn't even want to pick them because they just looked so beautiful. And the same thing now, you are ready to throw away. You go into a garden. You pick up beautiful flowers and you put them into your room and they look gorgeous, they look beautiful. And one day there is a point where you just take that same flower and throw it in the garbage can. There was one time that you did all that: you went out, you got in your garden, probably with scissors, and had all these beautiful, beautiful roses and things like that. And you had them placed in your room, in your living room probably. You liked them very much. And now with the same hands and the same person and the same flowers and the same room and the same vase, you take it and you throw it outside in the litterbox. So it has to be even more. It's a beauty which will never destroy itself. That is something that just continues. And this is what we have to be into. This is what we really have to get into, and then realize it, understand it. Because there is really something beautiful behind this beautiful nature, which is making it beautiful. And this is what we have to understand. This is what we have to realize. And if we can realize that Perfection, if we can realize that beauty, then we will really understand how beautiful this whole world is. Because then that barrier which is stopping us to be in love with everybody, to understand and to feel as a brother for everybody -- that barrier will be lifted off. And then it will be just beautiful. Because many premies sing this song: "We are One in the Spirit." Because they have understood that they are. really have to understand ourselves. And then we just will be able to understand. We will be able to recognize that Perfection, that beauty, that we are looking for. Then there won't be any riots. Then everything will be self-controlled. It will be more automatic than you have ever seen. You will see that those human beings that police have to chase will just know what to do. Because right now they are just running and running and running and running and running and running. And at that time they will have run as much as possible and they will have reached to their final destination, and everything will just be cooled off and just beautiful. They'll be just completely cooled off. You just won't believe it. It's like this boiling, boiling hot water, boiling hot water -- if you put your finger into it, it'll just burn your skin right away. And if somebody comes and pours a little medicine in it in a split of a second, the water is cooled down and you can put both your hands into it, and it won't do you any harm. And that's exactly the way it will be. Because there's all the deception and all these problems, problems, problems, problems going on within inside of man. And as soon as that Word is dropped into us, that Knowledge, that Perfection, that nectar -- as soon as it drops into us, it just makes it beautiful, just makes it absolutely calm, just makes it gorgeous. That nectar is within inside of us, and I was describing it yesterday, that a saint has also described it: seeing a well in the middle of heaven and all these people who are lame go to it and they drink it, and they drink it and they drink it. And they climb. They climb without stairs and they are lame. They don't take rockets. They don't take choppers. They don't take helicopters. They just walk, because it's such a high point. But still they walk. They walk to it. They go to it. And how do they walk to it? That's in a little mystery. That's a very little, very big little mystery. Very big for the world. And little for us. Because now it's not a mystery. This is a very big, little mystery. And this is the mystery that we have to solve. We are all Sherlock Holmes. We are trying to find this little thing that we are missing, you know. And it's like, Sherlock Holmes always has an assistant, who kind of keeps asking him questions and making the whole thing just so funny, because he does all these silly things. I mean, he's just so big, but he just looks so silly. And he does all these silly things, and that's how it is. Because this mind is our assistant. We are Sherlock Holmes trying to solve a mystery. And that pipe we always smoke is like our search for that thing. You know, that just keeps us busy searching. And we are all searching and searching and searching and searching to just solve this little mystery and there's this little funny man who just always keeps doing little funny things and just blows the whole thing off sometimes. But, one day we meet someone who opens up the whole thing, who opens up the whole case. And he is called Satguru. He is called Perfect Master. And he opens the whole case for us and says: "This is what happened, Mr. Holmes, and this is what happened, Mr. Holmes, and this is what happened, Mr. Holmes." And there is a little secret solved. That little mystery is solved and then you are very pleased. You are very happy because that's when you really understand. That's where you really get into the real, real happiness. And until that mystery is solved, you really cannot understand how happiness even comes to you. and say, "Wow, that's fantastic. I bet that's peace of mind." It's not. But what really is Peace of mind? That's what you have to understand. Not switching on air conditioning. Not sitting on chairs: that's not Peace. Peace is something else. Peace is beyond that which we think peace can be. And this is what we have to understand. This is the practical realization, the practical and individual experience that can really make us understand. Because it's like, if I eat and I say, "Okay mister, I am eating for my brother today. My brother can go ahead and do all the music practices he likes, and I'll eat it for him." And I can eat as much as I like. Still, that won't do any good to my brother, because he'll still be hungry, you know? 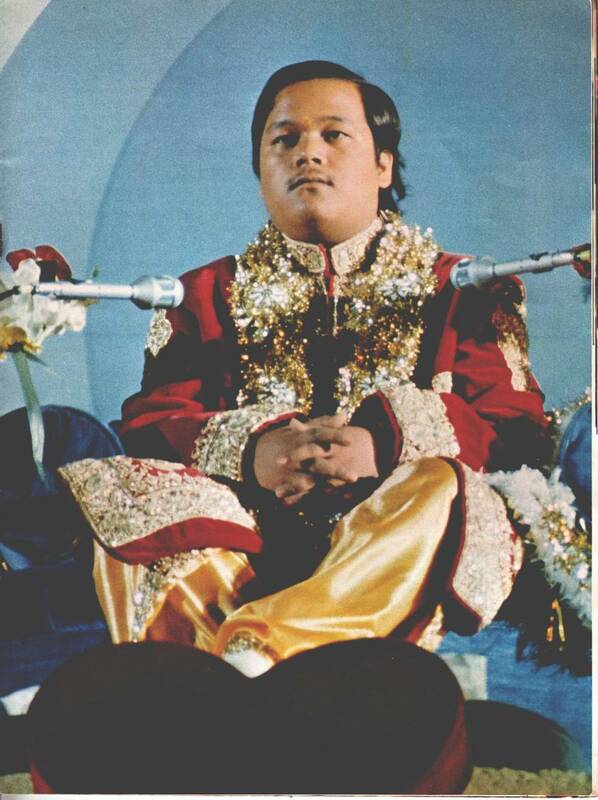 And he'll be playing and he'll be thinking, "I wonder if Maharaj Ji has eaten his lunch, because I am still feeling hungry." And there I'll be eating and I'll finish and he thinks, "I wonder if Maharaj Ji has eaten food or not, because I am still feeling hungry. He is supposed to eat it for me." You know, and still, he will be always hungry. It's like an individual experience. If he has got to eat it, he has got to eat it himself. And this is what Knowledge is. No matter how much I talk about it, until and unless you realize it practically, it's not going to do you any good. And it's almost like a movie, where you can see people moving and you can see people talking. But movie is not perfect example, because a movie is just illusion. This is a practical thing we are talking about. This is a practical thing where we are really, really telling you to understand this Knowledge, urging you, requesting you, to understand this Knowledge. Because it is just beautiful. We want to tell you for some reason. Maybe we are a little bit mad and crazy. I don't know why. We just want to tell you about this thing. We can't help ourselves. We just can't help ourselves shouting about it, you know, even if we sit down and make up our minds not to tell you about it. We just can't help it. We've got to tell you about it. So that's why we scream and shout. To tell you about it. And once we have told you about it, we are still going to hang around. And we will wait until you really get it. Because we want you to have it. It's beautiful. It's just Perfect, you know. It's just like a little thing: A mother goes to see something, and mother likes it and says, "Oh, you should really go and see that. Oh it's beautiful. Oh, you should really go and see that." And it's like for some reason she really wants you to go and see that thing. And she waits for you to go and see that. It's the same thing: we have realized it; we can meditate upon it. But we are walking and talking and sitting and driving and flying and you name it and we can still meditate on it. Because it's always vibrating within inside of us. So I think it's been really beautiful seeing all the premies up here, and it's really been good. I hope they've been cooperating and I hope when they go back they will propagate this Knowledge more and more. Because you know, I just told you, we can't help it. At least / can't help it, telling people about this Knowledge. And I think the same condition should be with you. Because you have also understood it and you have to go back. It's your duty to tell other people about this Knowledge, premies. And ladies and gentlemen, we are really pleased that you have come here to listen to what we have to say. And I hope you will understand us, because what we mean is just about this Knowledge and we mean nothing else. We don't ask money from you. We don't ask for anything else. We just want you to have this Knowledge free of charge. And this is all we want and I think it's really been beautiful. And then I think it's time I should say goodbye to you and may God bless you all. And premies: keep on doing meditation. It's going to be more beautiful. Thank you very much.